from Apollo to the end of the Space Shuttle Program — and beyond. Pete Crow photograph of the launch of the Mars Science Laboratory, Saturday morning, November 26, 2011, from the roof of the Vehicle Assembly Building at Kennedy Space Center, Florida. the rover during descent through the upper atmosphere of Mars. 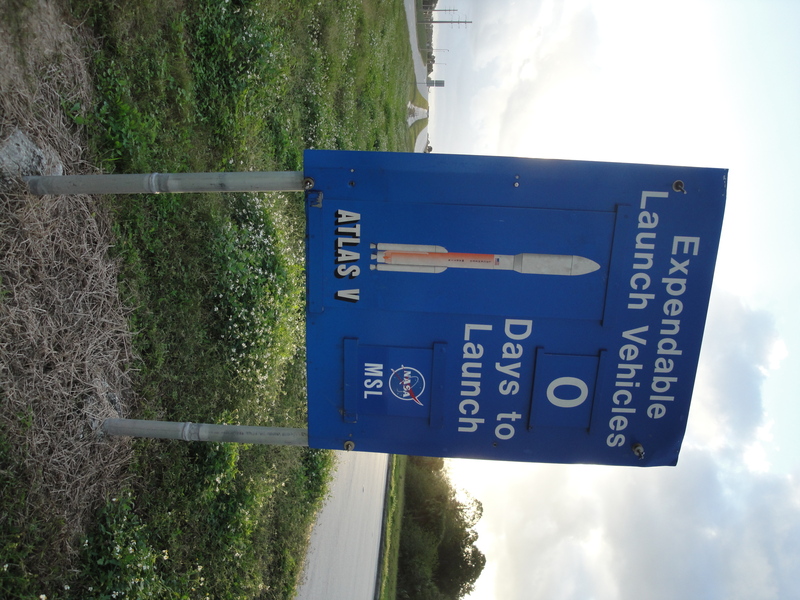 The "days to launch" sign during the Shuttle missions was on State Road 3 but, surprise, for the Mars Science Laboratory launch it popped up just inside the State Highway 405 guard gate. more hazardous than primary ones. Mars’ Gale Crater could be or has been favorable for microbial life. correction maneuver during the trip is being planned for mid-January. Deutsches Zentrum für Luft- und Raumfahrt. rover was designed, developed and assembled at JPL. 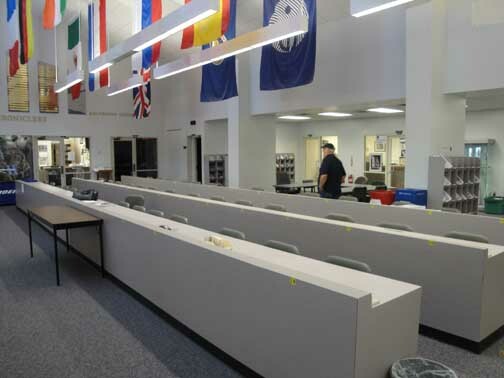 On Monday the media center was empty and the KSC media staff said they were glad to see the media back. It has been so lonely without us. Maybe, maybe not. With only an exception or two the NASA KSC pr staff is terrific to deal with. 1 pm WHAT DO WE KNOW ABOUT MARS? 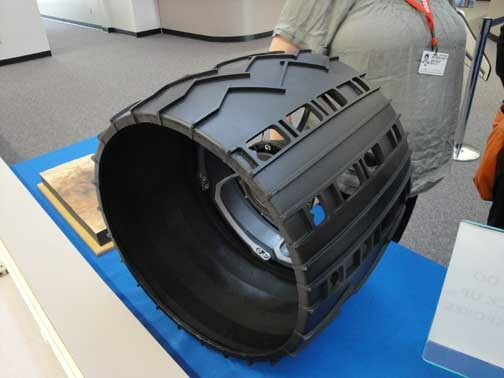 Example of a wheel from the MSL (MSL has six) in the Media Center at KSC. 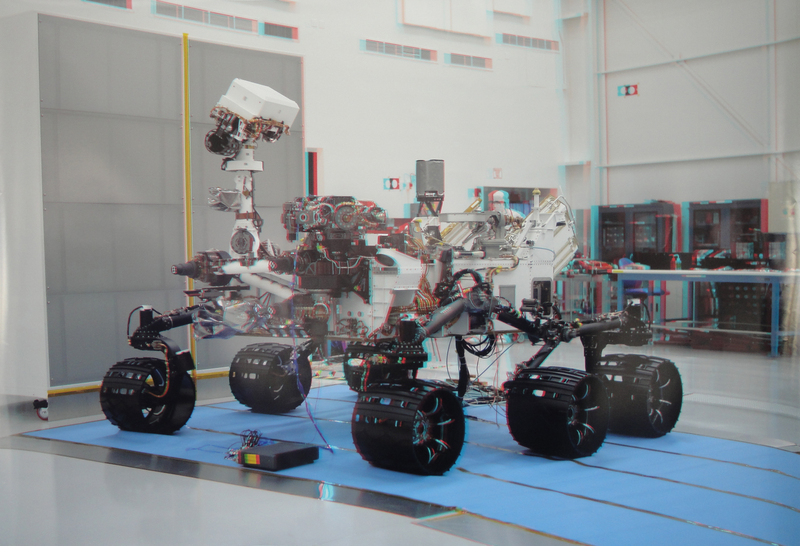 The rover was designed in Pasadena, CA, at the Jet Propulsion Laboratory. JPL was so proud they put their name on the tire (like Firestone) and were told by a peevish NASA to take their name off. They did, but take a look at those odd holes in the tire. Those holes are Morse Code letters J, P and L.
The launch of the Mars Science Laboratory, a two-ton rover packed with the ability to conduct scientific experiments is five days away. Thanksgiving is Thursday, so the launch clock will go from L-2 on Wednesday, skip Thursday, and L-1 will be on Friday. NASA has packed the week with briefings for the media and, when the Tweeters are allowed in on Friday, there will be a bunch more briefings for them. Months ago I requested credentials for the launch, uncertain that I would be in Florida. Most of the fall I have been in Los Angeles or Austin at Red Studios, at the American Film Market and at the Austin Film Festival. I remembered that the launch was going to be about Thanksgiving. Thanksgiving is next Thursday. I log on to the NASA Media site and download the schedule. Uh-oh, Briefings begin in the morning. I ponder this. Carol Anne, who photographs for me, is in Virginia. She will not return until Monday night and I will need to pick her up at the airport in Orlando. I’ve lost her arrival time, but can figure it out. The NASA briefings begin at 11 Monday morning and go most of the day. I need to build in an extra hour to pick up my credentials, a task complicated by NASA sometimes credentialing at the badging office on State Highway 405, and at other times on State Road 3. Normally a quick call to the NASA Press office tells me where to go. But during the summer my iPhone brunched down my telephone book. I take a deep breath and bet on the State Road 405 badging office and, bet correctly. But then the badging officer demands that I show her my “Credential Letter” in addition to my passport and my driver’s license. No one has ever asked me to print out the email confirming my accreditation before. “I will go find somewhere and print it out,” I finally say giving up, smiling my aging choir boy smile. 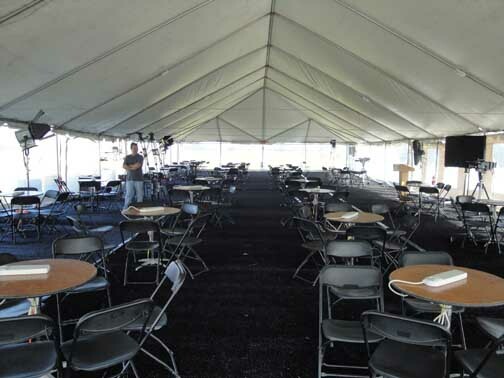 On Monday morning the Tweet tent was ready for the Tweeters, loaded with high tech equipment. But wait -- the Tweeters don't come until Friday because the launch has been pushed back a day. So will all of this expensive stuff sit out here under the sun for most of the week? Apparently so -- a dour guard tells me he has settled in to babysit everything 24/7 until the Tweeters show up. I sign up for all of the tours for the day and am almost the only one on the list. I banter with Jennifer and Laurel and re-punch the media numbers into my iPhone. The media center is empty. Will I need to request work space? No. Only 178 media are accredited and half or more will not show up. This means that this time Tweeters, at 150, will almost match the number of media. I have a list of access requests and discuss them. I am told with a single exception fulfilling them should be no problem. I’m given the contacts and the email addresses. Will it really be this easy now that 90-percent of the media is gone and we’re back to un-manned missions where human life is no longer at stake? 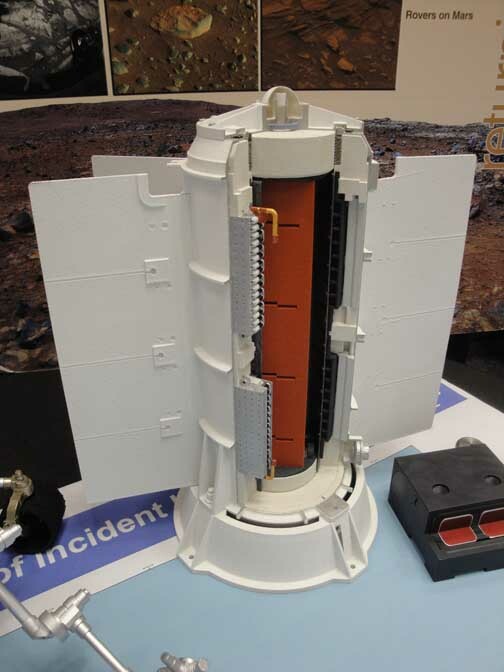 The Mars Science Laboratory carries is powered by uranium. If that canister of uranium is ruptured on launch, it could contaminate a wide area around the launch site. 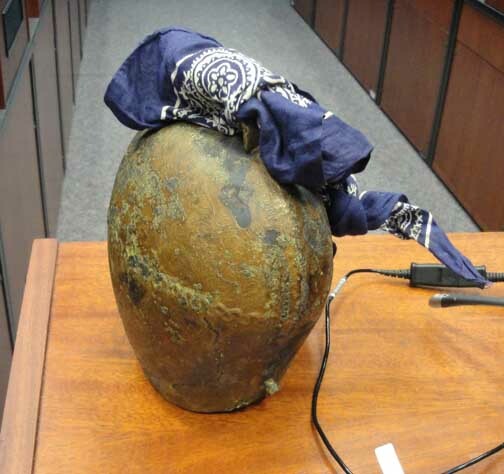 NASA this morning wants the media to see the precautions they are taking, and to see an example of the canister itself. First we visit the Radiological Control Center which monitors more than one hundred radiation devices in a huge swatch of central Florida. 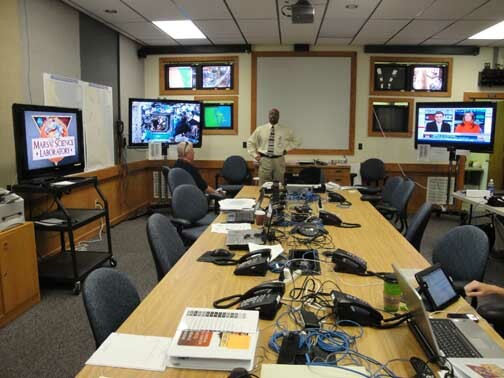 Then we are tasken into a separate control room which, in the event of an accident, will be responsible for informing the media. It’s very convincing. These guys cannot afford an accident, especially one that radiates central Florida. It ain’t gonna happen (and on Saturday, it doesn’t). Lots of stuff is in the same building as the Radiological Control Center, including a dorm of the third floor for the astronauts. The media was welcomed and greeted in the foyer before going upstairs to the control rooms. NASA is very sensitive that any danger issues be addressed and answered. 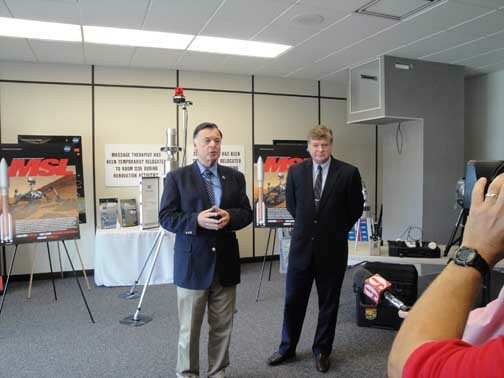 Example of one of several different radiological monitoring devices NASA placed in large numbers over a huge swatch of central Florida. These devices are sending data constantly and are being monitored in the Radiological Control Center constantly during and following launch. Many of the facilities at Kennedy Space Center are now being re-purposed with the end of the Space Shuttle program. Feeling tension and need a massage? 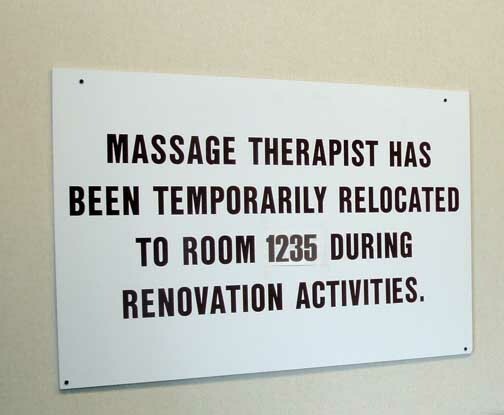 The massage therapist has moved. This sign is prominent in the foyer of the building where the Radiological Control Center is located. If something bad happens during launch (and it never has) these guys would know first. The remote monitoring devices are reporting constantly to these monitors. The Cowbell. This is a busy and not always quiet room. If something bad happens or if the attention of everyone in the room is required, CLANG, CLANG, CLANG the cowbell is used. The bell was demonstrated for the unruly media and is quite convincing. My ears are still ringing. Moo. 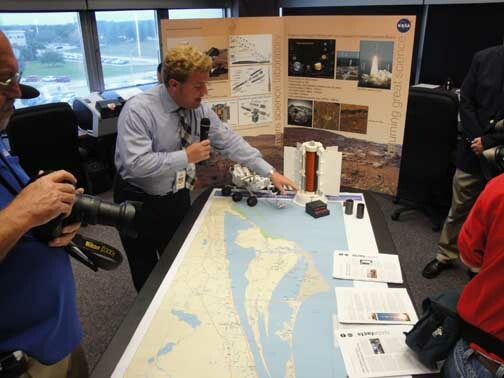 Department of Energy official explains how the MSL is powered, and why the uranium in the MSL can be launched safely. Later in the week he told me that the MSL will have power to operate as long as 14 years, long after the MSL is expected to be operations on the surface of Mars. MSL's power source. Small but powerful and so completely sealed that all efforts to smash the capsule and expose the uranium failed. They figured out how to seal it up; they never managed to bust it open. Nonetheless, a large operation stands by in the Radiological Control Center should the capsule rupture and scatter uranium. This is the press room where, should there be a radiological danger after launch of the MSL, the press and public will be informed. Big operation. Never been needed. 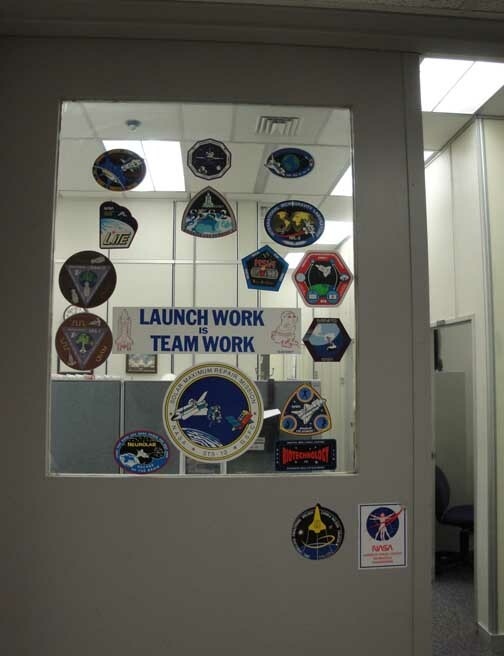 Pride in NASA, and pride in the accomplishments of the American space program are everywhere, even as these offices empty out and people lose their jobs. The shuttle is gone and the future of the United States in space, while not tenuous, is not as robust as it once was when we were launching humans into space. Michael Meyer (second from left), Bethany Ehlmann (second from right) and John Grotzinger (far right) spent an hour in early afternoon discussing "What do we know about Mars?" The answer is, a lot, including that water appears to be trapped there and while it is not conclusive that life ever existed on Mars, there's growing suspicion that it may have, and may still. 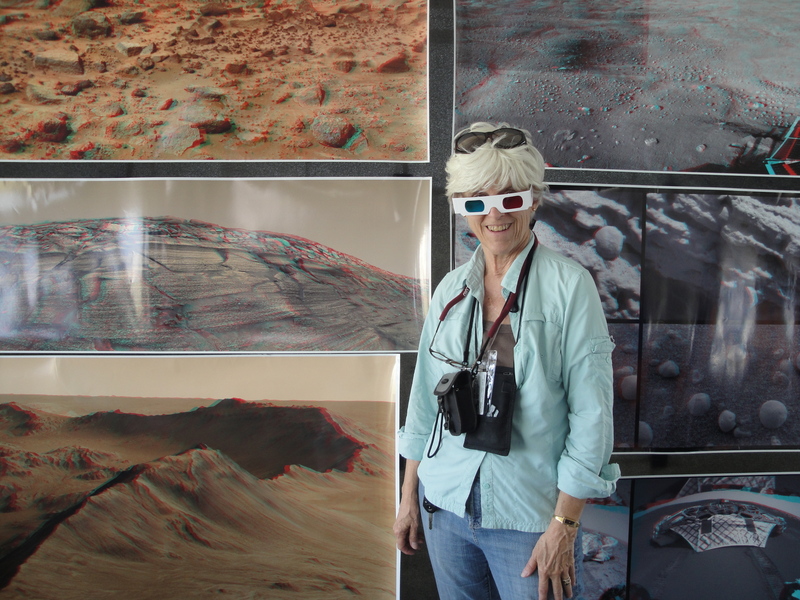 Meyer is the lead scientist on the Mars Exploration Program. Ehlmann is a scientist at the Jet Propulsion Laboratory and an assistant professor at California Institute of Technology. 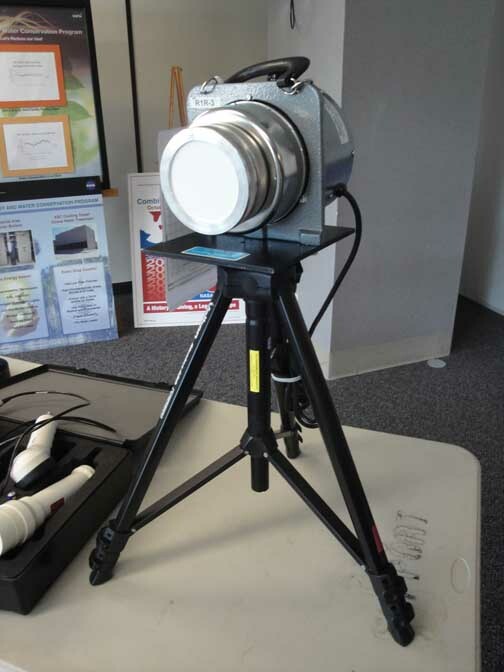 Grotzinger is project scientist, Mars Science Laboratory and California Institue of Technology. 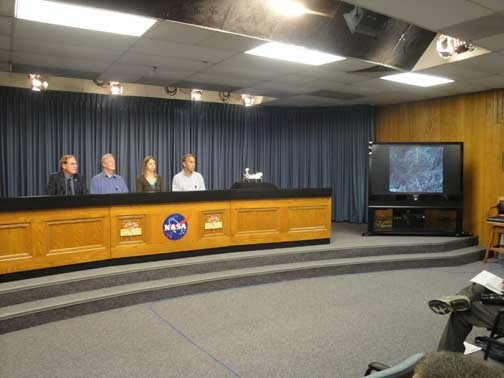 NASA has moderators (far left) for all conferences, usually drawn from their public relations staffs. 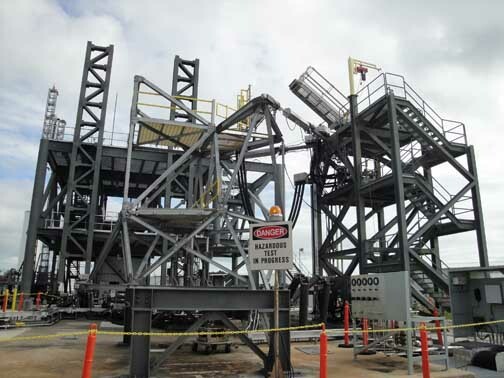 KSC Launch Equipment Test Facility is a rarely seen place because testing is often going on here, and testing can be hazardous. These days the facility has many fewer people, including only one remaining government NASA employee. Tests are carefully studied and controlled from this room. 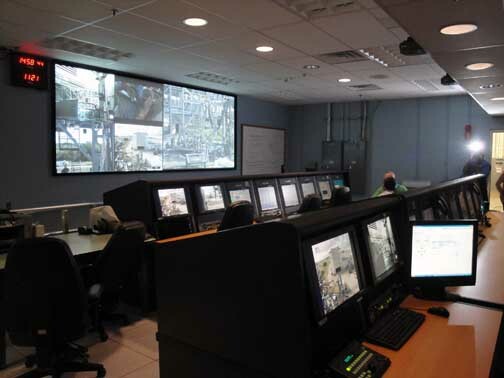 This is the Control Room in the Launch Equipment Test Facility. 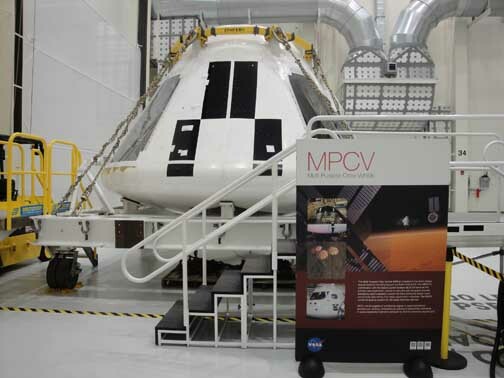 Orion, which looks like an Apollo capsule on sterioids, is supposed to be the next generation NASA space vehicle. As with Apollo, this vehicle is meant to travel deeper into space than low earth orbit where the shuttle and the International Space Station traveled. It is hoped that Orion can land on an asteroid, the Moon or even Mars. Until late 2012 it was, however, a capsule without a rocket or a mission. This building is known officially as "The Checkout Building for Orion" and has been extensively repurposed for its earlier uses. The shuttle;s Canister Rotation Facility now houses the Orion escape mechanism. After the deaths of the Columbia astronauts on STS-107 great re-design effort was put into affording future astronauts more opportunities to survive. 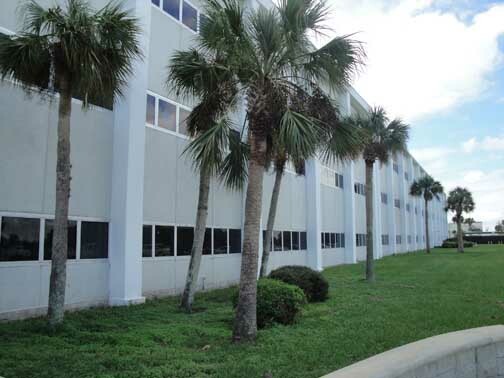 How to escape and survive an accident involving Orion is being studied in this building. The escape mechanism would pull the Orion capsule away from the rocket and allow it to land by parachute on water or land. Escaping quickly enough is no simple matter either technologically, or for the astronauts themselves. The G-force required to escape is 15 Gs, a gravity force that the human body can only endure about three seconds. By contrast Apollo subjected Astronauts to 6-Gs and the Shuttle to 3-Gs. .”petecrow/NASA” © 2011 by / Peter M. Crow and the Peter Michael Crow Trust and by Seine/Harbour® Productions, LLC, Studio City, California. We spent the week at Kennedy Space Center in briefings on the Mars Science Laboratory which is scheduled to launch at 10:02 am EST, November 26, 2012, Saturday morning. Carol Anne will shoot it from the roof of the Launch Control Center. I’ll be on the roof of the Vehicle Assembly Building. 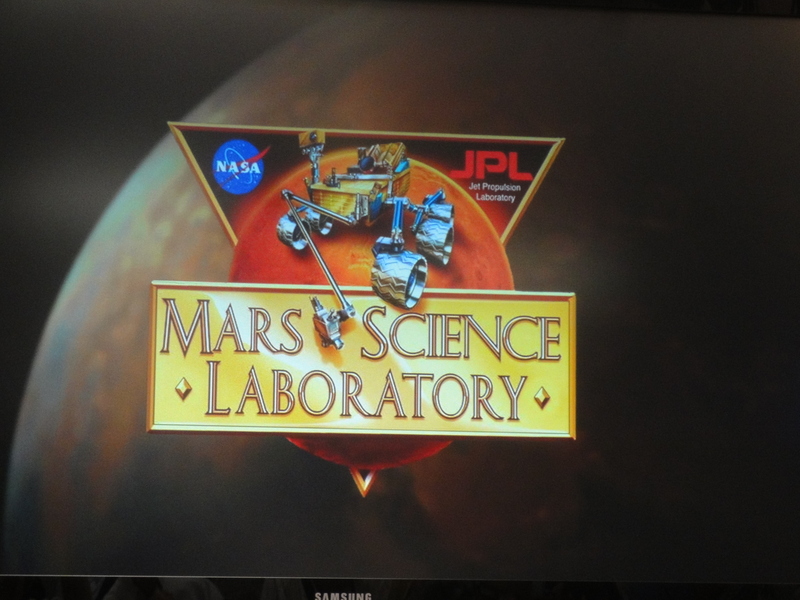 The Lab is scheduled to land on Mars on August 6, 2012. Read more about this mission and other NASA stuff HERE. Carol Anne on the roadway that carried the Atlas rocket and the Mars Science Laboratory to Launch Pad 41 at Kennedy Space Center a few minutes earlier. It is Friday morning, November 25, 2011. With MSL on the pad, all that is left that is needed is favorable weather. 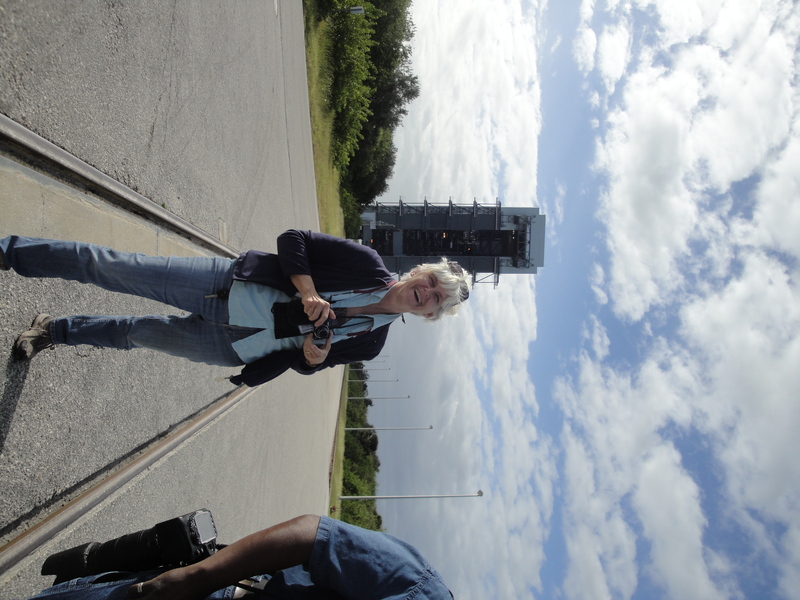 Behind Carol Anne is the Pad 41 hangar belonging to the publicly owned United Launch Alliance (ULA) where the Atlas rocket and the MSL were mated. 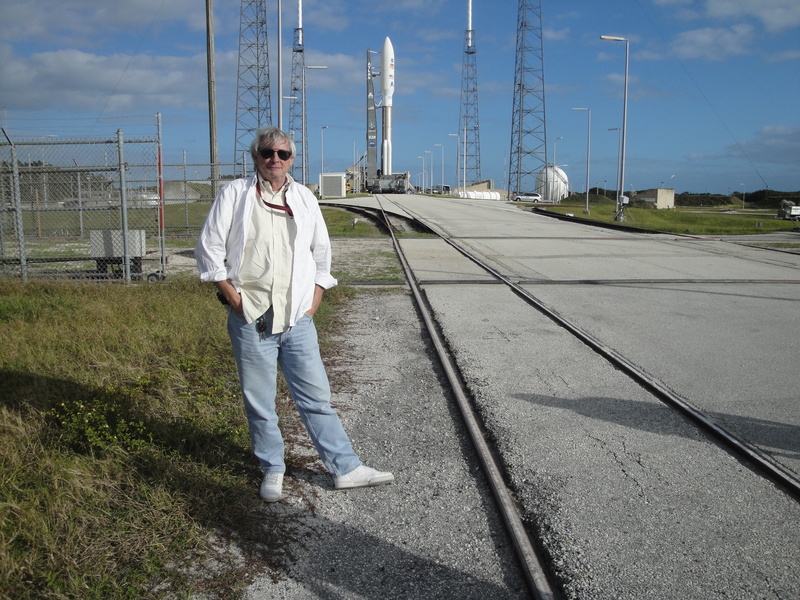 Pete at KSC Launch Pad 41. The Atlas rocket with the Mars Science Laboratory (MSL) on top is in the background. The MSL weighs as astounding 2,000 pounds and is expected to determine once and for all whether there is or was life on Mars (hint: there was, and probably still is). It will also continue paving the way for a manned landing on Mars planned for about 2030. Before MSL lands the landing area at Gale Crater will be overflown by the two satellites the United States currently has on station orbiting Mars. To find NASA’s video of the launch of the Mars Science Laboratory click HERE — then look to the right for the launch video. 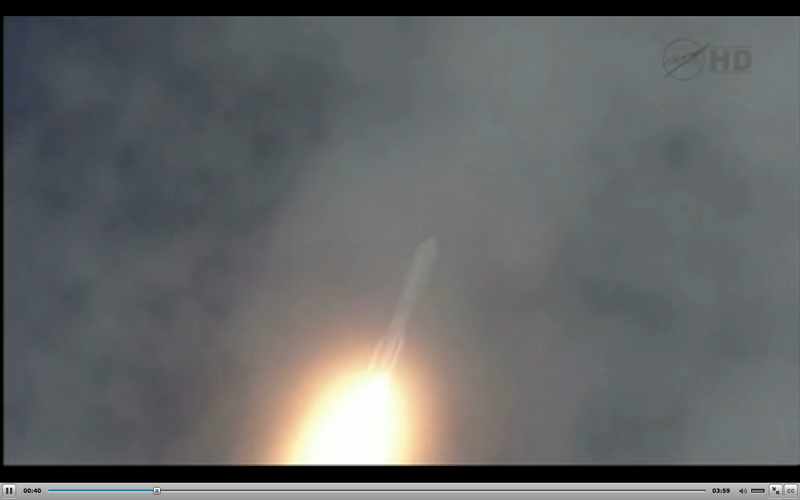 The launch video, from NASA, runs 3:59 and begins 15 seconds before the launch. Both of the photographs below are 3D. NASA provided the Tweeters with red/green glasses. You’ll have to find your own 3D glasses, but if you do, you’ll find these photos are in 3D … we checked … but this 3D picture will not work with 3D glasses you nabbed at the multiplex. You need glasses with one red, and one green, lens as shown in the bottom picture. The blog petecrow/NASA is copyrighted property of Seine/Harbour™ Productions, Studio, City, California, © 2011. Visit selections from our historic photographic archive of more than 300,000 photographs dating back to the American Civil War HERE. 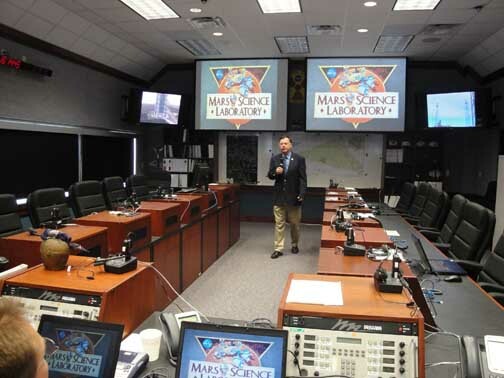 Mars Science Laboratory launches no earlier than Saturday, November 26, 2011, 10:02 am EST. The Landing is scheduled for August 6, 2012. See NASA’s animation of how MSL’s Curiosity rover will land on Mars HERE. Watch the launch live on Saturday morning NASA TV. 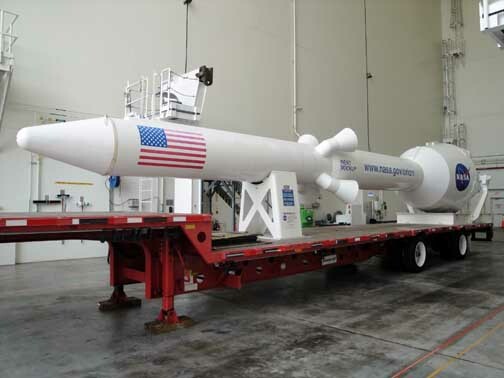 The Mars Science Lab, atop an Atlas rocket, is moved from its hangar (left) to Pad 41 (right — the four lightning towers) where it is scheduled to begin a 9 month trip to the surface of Mars at 10:02 am, Saturday, November 26, 2011. 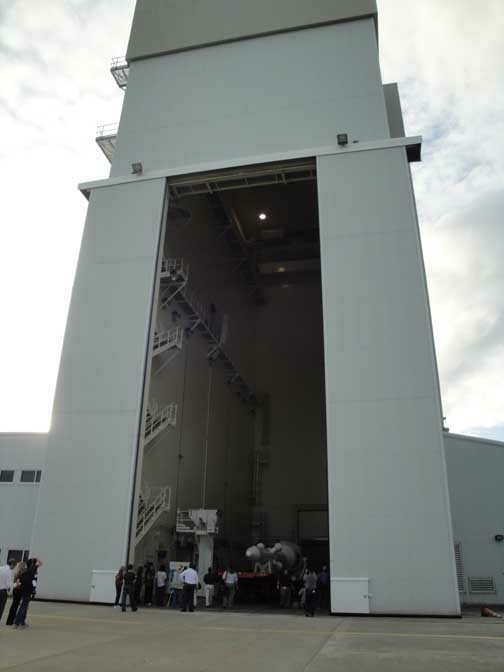 This photo, taken about 9 am, Friday, November 25, 2011, shows the MSL stack about midway between the pad and the hangar. The photo was taken from The Beach House, a relaxation villa for astronauts (and once a private from before the space center took the property) on the Atlantic Ocean beach. On the extreme far right of this photograph, Pad 39-A, is visible. The final shuttle missions were launched from 39-A.